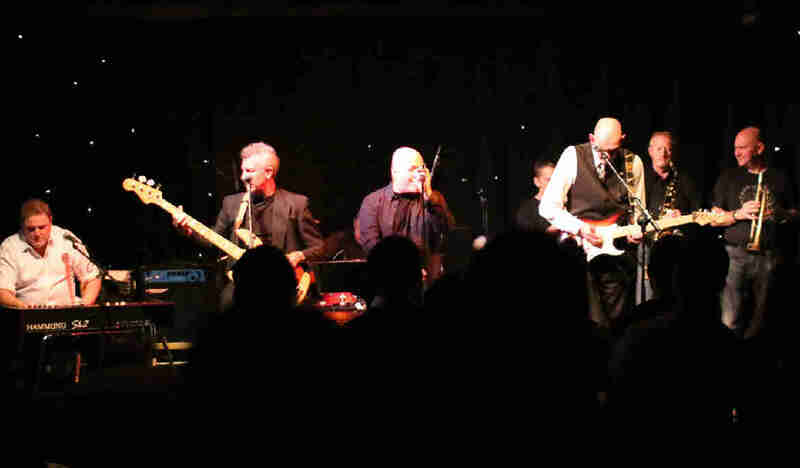 Lights Out By Nine return to Backstage at the Green with founding member Tom Stirling back on Hammond organ and John Frame taking up lead vocal duties, adding two strong vocalists to the band’s revamped line up. With eighteen month’s of gigging under their belts, the band’s reputation has been growing strongly in their new form. Still strongly rooted in rhythm and blues, LOBN have now introduced a flavour of soul and funk to the current set list, which has been going down very well with audiences all over the country and with new original material being introduced on a regular basis, plans are afoot to record a new album this year. The new single release ‘Take It Or Leave It’ on River Records will be available on ITunes, Amazon Download, Spotify etc this summer. LOBN, over their 28 year career, have opened shows, and shared festivals stages with, Status Quo, Buddy Guy, their good friends the Average White Band (ten times!) Nazareth, Dr Feelgood, the Zombies, and, another long time friend, Hamish Stuart, a and many more ‘names’ over the years, including Joe Walsh and the best of Scottish artists at the Frankie Miller tribute show at the Glasgow Barrowlands. This July, the band will support, the British music legend, Paul Carrack to add to the long list. With two top five American radio albums, and live recordings from the legendary BBC Pebble Mill studios in Birmingham, and Maida Vale studios in London, this band comes with a pedigree.